As if I didn’t already love dip enough, stick it in a bread bowl and I’m on cloud nine. 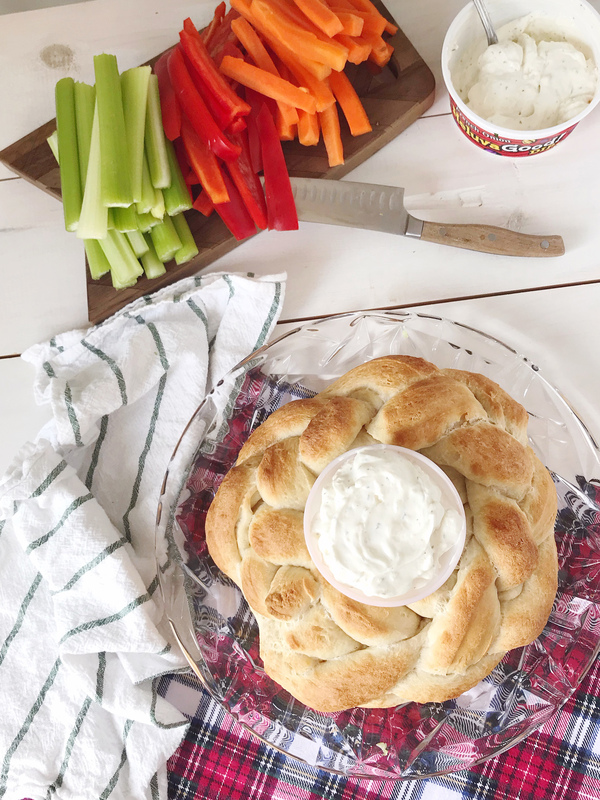 I thought it would be fun for the holidays to put a new spin on this dip and bread bowl combination and found an easy way to make my own bread “wreath” to wrap around a bowl of Heluva Good! Dips. 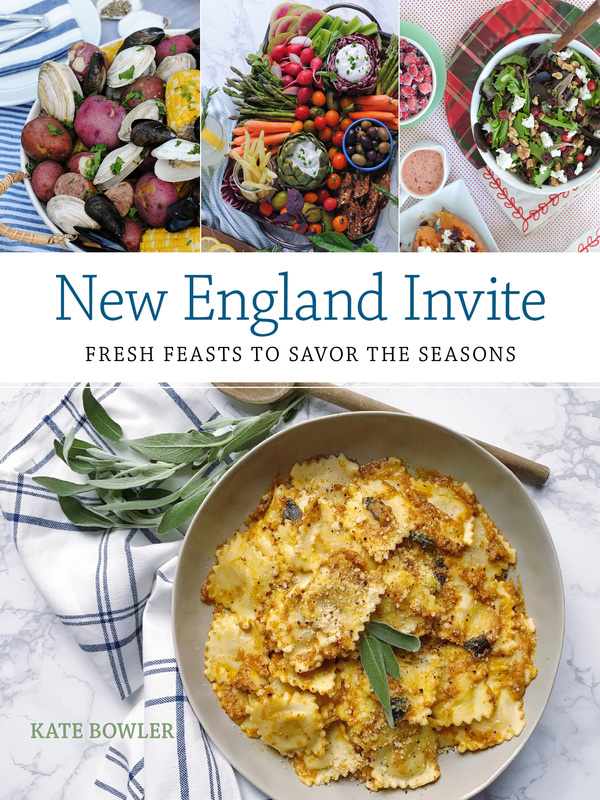 This is a holiday entertaining DIY for those who are short on time but still want to put something extra special out during this season for guests. The whole thing took me under a half an hour to make thanks to a secret weapon: store-bought bread dough. You can find this French bread dough in tubes in the dairy section at most grocery stores. 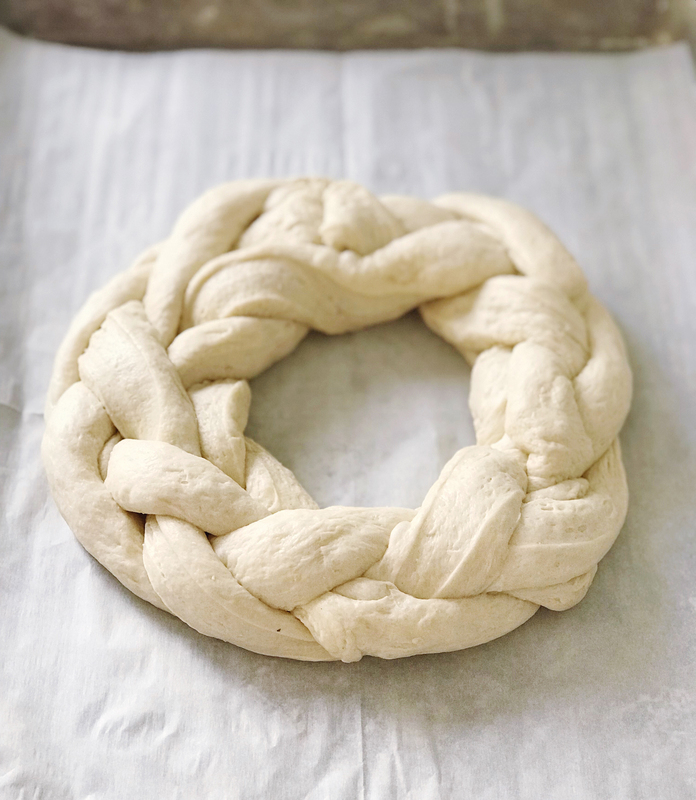 For this wreath I used two tubes of the dough; remove the dough from the containers and use a pizza wheel or a sharp knife to cut the dough into three long strips. Repeat with the second loaf of dough and line them up on a parchment paper lined baking sheet. 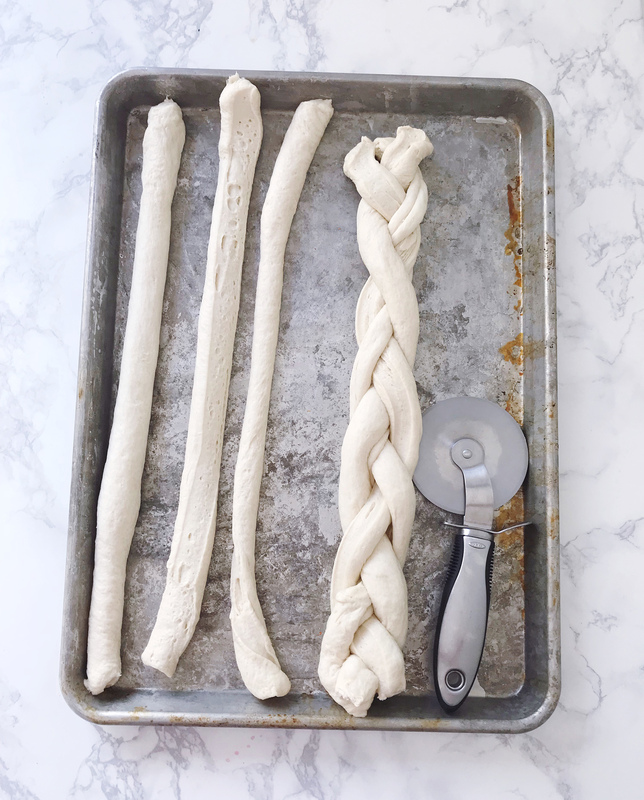 I used a basic braid technique to connect the three strips together, and then did the same with the second set of dough strips. 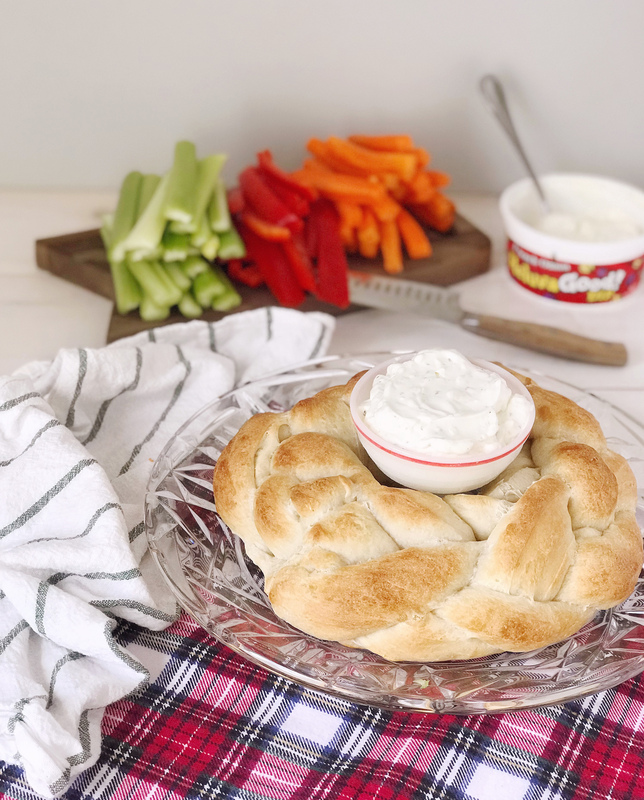 Then I took a bowl about the size of the dip bowl I planned to use, and wrapped the braided dough around the bowl twice and tucked the edges underneath the wreath shape that it made. Remove the bowl from the center and place the dough wreath in the oven; bake it as directed on the package. Mine baked at 350 degrees for a little over 20 minutes, until it was a golden brown. 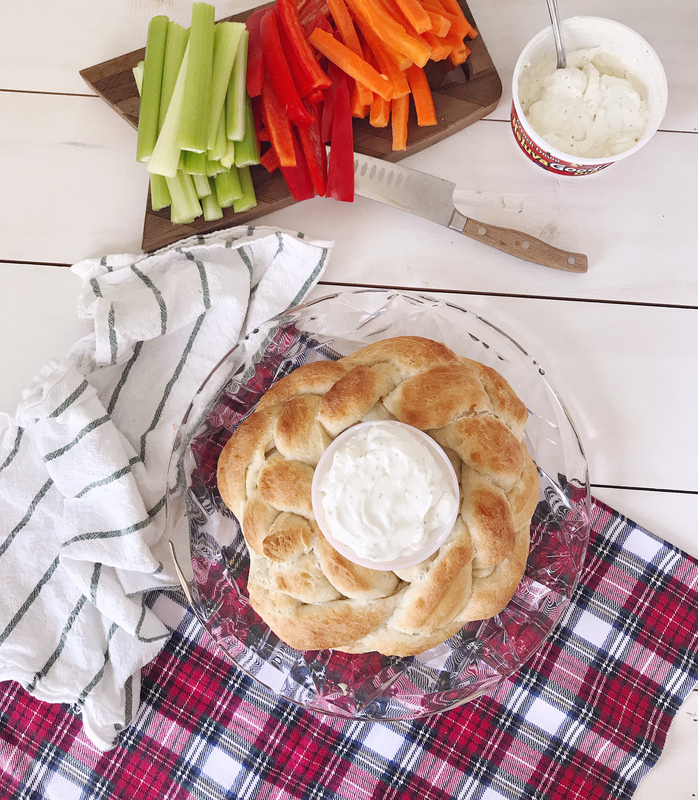 Let it cool slightly and then insert your bowl back in the center of the bread wreath, filling the bowl with your favorite Heluva Good! Dip. I served the bread bowl a variety of cool, crispy, colorful vegetables. The whole thing looks so very festive – but only for about 30 seconds before I was ready to dig into it and get snacking! 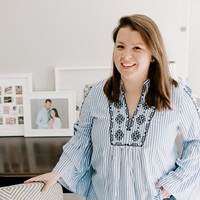 Please note: This was created in partnership with Heluva Good! Dips. All opinions, images, and content are my own. Thank you for supporting brands that support this site! Cranberry-Ginger Punch and Cranberry Baked Brie. Getting Cozy.